We are constantly striving to create a better world for dogs, cats and communities. If you’re a journalist needing information or support, our media team are here to help. Our team is available for comments, interviews and information. For all press and media enquiries, contact Sarah Hastelow, PR and Media Officer via sarah@mayhewanimalhome.org or 07507 491105. These contact details are for the use of journalists only and are not suitable for general Mayhew enquiries. Mayhew has a wealth of experience in dealing with animal welfare cases and animal rescue stories. We have an extensive back catalogue of case studies, which may be used to support your articles. If you are looking for specific statistics to support your work, please get in touch with our press office and we will do our best to help. Mayhew is lucky to have several celebrity ambassadors that support our work. Their support allows us to take care of more animals and to help more people in our local community. Find out more about our Celebrity Ambassadors. 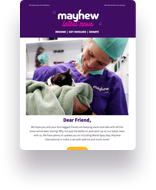 Want to stay up to date with all of the latest news from Mayhew? Sign up to our press release alerts. For all press and media enquiries, please contact Sarah Hastelow (for the use of journalists only).